Perspective, Hong Kong’s premiere architecture and design magazine, is proud to present the 9th 40 Under 40 programme, recognising the region’s rising young design stars from across Asia. Nominations have poured in highlighting young talents from six design fields — art, architecture, interiors, graphic/new media, products, and fashion/accessories. 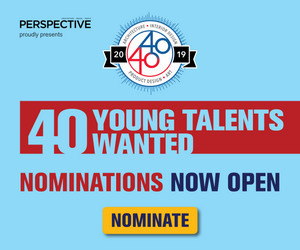 The final 40 will be chosen based on the nominee’s professional achievements, contributions to the industry, and potential for future development and growth.